Sometimes you want to have a civilized, sit-down lunch with white napkins, crystal glassware, and great service. Sometimes you want said civilized lunch because you’re entertaining business associates and grabbing sandwiches just won’t do. Other times it’s just because you want a little pampering or me time to save your sanity or break up a stressful day. 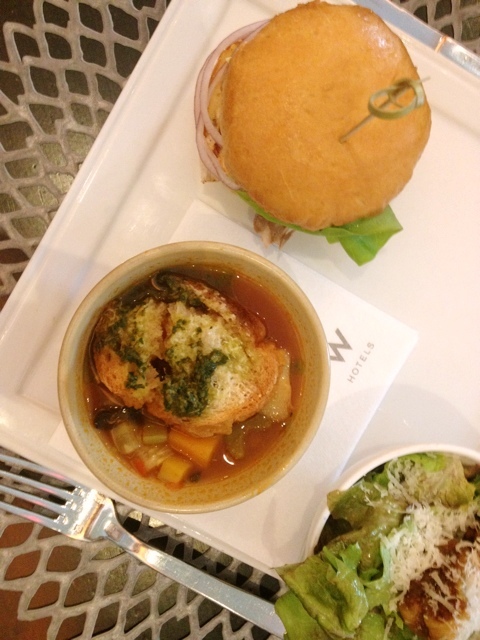 No matter what your motivation, TRACE at the W Hotel is up to the task of making lunch just right. If you’re a bit pressed for time Lunch on the Fly is right up your alley. This mini menu is designed to come out quickly but still treat you to quality cuisine. You won’t walk away hungry; choose a veggie burger, red fish sandwich, or smoke beef brisket sandwich and then add a soup and salad. For just $16 it’s a good value too, particularly given the high quality ingredients TRACE’s forager Valerie Broussard works daily to source for the restaurant. All of the Lunch on the Fly courses come out at once so be sure to do your chatting while you wait as you can expect a silence to descend on the table once lunch is served. Oh, and be sure to get the doughnuts to go. You’ll thank me. I promise. 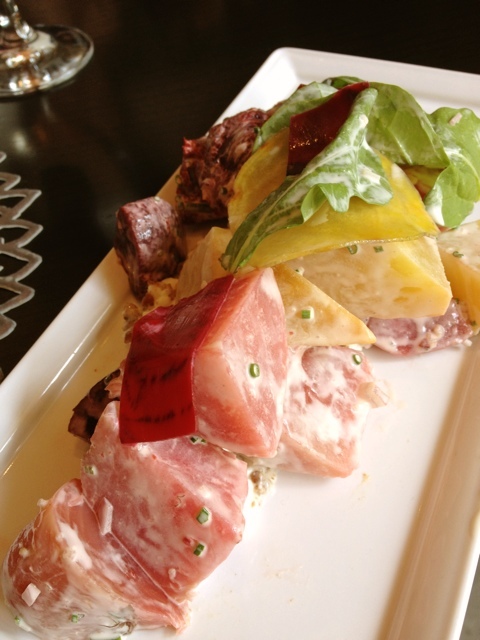 If you have a little more time for lunch or want to explore the rest of the menu, you’ll find a something for every tast. 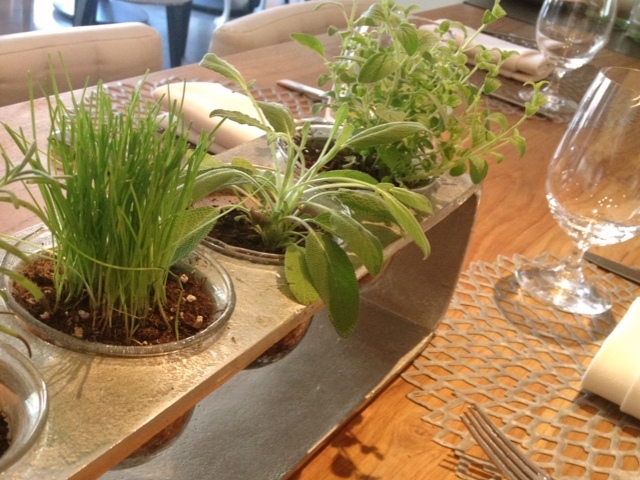 All of TRACE’s salads are substantial and lush with local in-season ingredients. 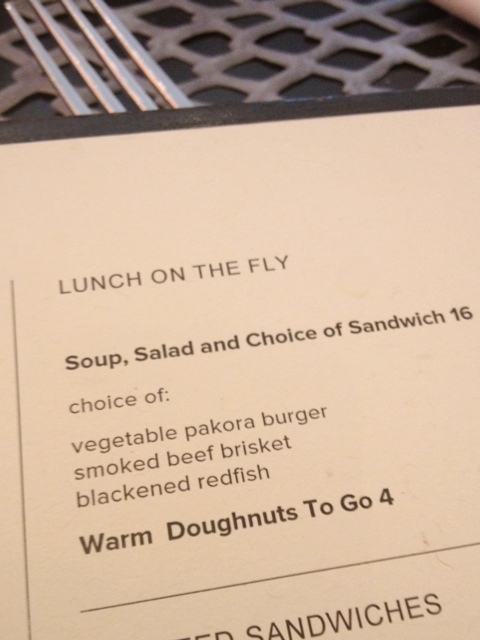 I’m particularly fond of the Roasted Beet Salad. It’s filling, a bit rich thanks to goat cheese mousse, and you’ll feel so wholesome for making your lunch of beets. For a great taste of Texas try the Dirty Rice Stuffed Quail and if you’re craving a burger during your upscale lunch go for it – their Butcher Burger features quality toppings like Tillamook cheddar, Dai Due mustard, and house-made pickles. If you get the burger (or any sandwich really) the garlic fries are a must. The first time friends and I tried them we dubbed them “crack fries” because they are so addictive. Twice fried and tossed in garlic butter they are sheer decadence. And speaking of decadence, the homemade pasta with bacon lardons, toasted pecans, and caveman blue cheese is richness in a bowl. 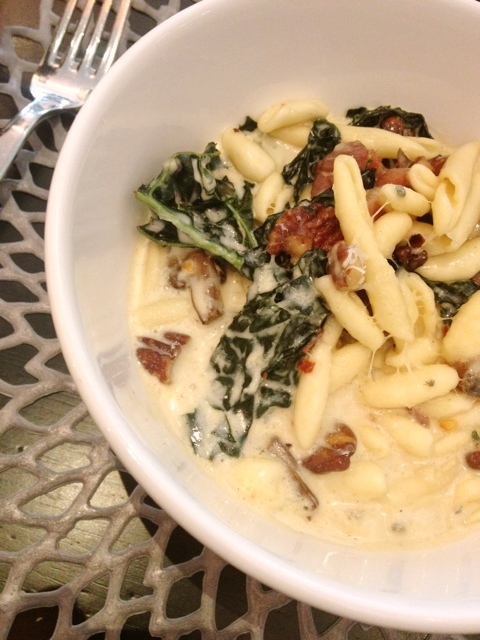 Smooth, creamy, and just a little salty thanks to the lardons and blue cheese, you’ll need to schedule a post-lunch nap if you make this your menu selection. If you’d like a few more vegetables with your lunch than cheese and pasta and burgers might provide, try the brussels sprouts. 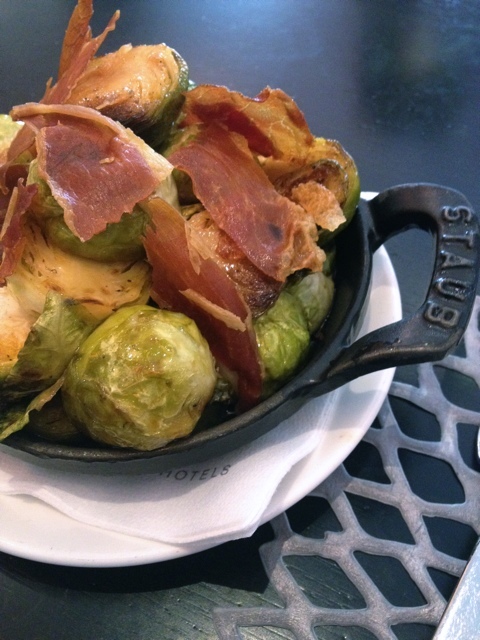 These roasted green globes are tossed in white balsamic dressing and topped with crisp prosciutto for a nicely balanced flavor profile that may even make brussels haters rethink their position. Thanks to local forager Valerie’s efforts the chefs at TRACE always have new and interesting ingredients to work with, so their menu changes fairly regularly. This is of course a great reason to return regularly. I also like that TRACE does a lovely job of balancing the interesting and unexpected with accessible menu items so you can take a group with diverse tastes there and know everyone will find something they’ll truly enjoy. The service is, as you would expect, impeccable and they take reservations which is just the icing on the cake – or the warm doughnuts after lunch.